Last night, the floodlights were on at my favorite skating lake. Several children wearing plastic skates and shiny helmets were gliding on the ice, shepherded by young parents. A father pulled a Nordic-looking sled with upturned runners, his bundled-up cargo insisting, “More!” each time he stopped. They were enjoying one of winter’s greatest gifts: the smooth, frozen surfaces of our northern lakes and ponds. The gift is ephemeral. Some winters, our skates never leave the basement. Other years, the snow holds off and there’s black ice before Christmas. We skate as much as we can, knowing our days of clear ice are numbered. As winter progresses, rain may turn the surface to water–but the temperature plummets again and the resurfaced plane draws us back. The ice was magic to me as a child. Lying on my padded belly, I stared down into it and wondered how all those little white bubbles got in there. I tested how far I could slide–then turned and lay watching the clouds until the cold began to seep through my wool coat. I was fascinated by what was caught in the ice: a leaf, a weed, a small fish. But ice is not magic. It’s chemistry and physics. Ice formation begins in late summer, when the upper layer of the lake begins cooling. In this process, called turnover, the cooling water becomes denser and heavier, sinking toward the bottom and forcing warmer, lighter water to the surface. The cooling and sinking process continues until, one day in November or December, the whole lake reaches 39.2 degrees, the point at which water reaches its maximum density. After the lake reaches this tipping point, as its surface water is exposed to freezing air, the water molecules expand and become less dense. This allows them to float above the 39-degree water. When they cool to 32 degrees, small discs form. If the wind stays down, these discs branch out into tree-like shapes that expand across the surface of the water until the whole cove or pond is covered by a thin skim. Once the lake has frozen over, the progress of ice formation slows. As long as the air stays colder than the ice, the ice grows thicker; however, each new centimeter of ice requires more cooling than the last one to form, because the water below is better insulated. Eventually, the ice is thick enough to act as a complete insulator. Without further energy loss from the lake, the water beneath remains a chilly, but liquid, 39 degrees. Incidentally, there’s beautiful language involved with the science of limnology, or freshwater lakes. Our northern lakes are monomictic, meaning they mix, or turn over, once a year. The layers have names, too: the surface is the epilimnion; the bottom layer is the hypolimnion, and the water in between is the metalimnion. Black ice–hard, strong, and smooth–is the skater’s joy. It forms slowly under calm conditions. Individual crystals grow downward and are closely packed, which keeps out impurities (like air bubbles). It’s called black because it is transparent, and the water below absorbs most or all of the light. 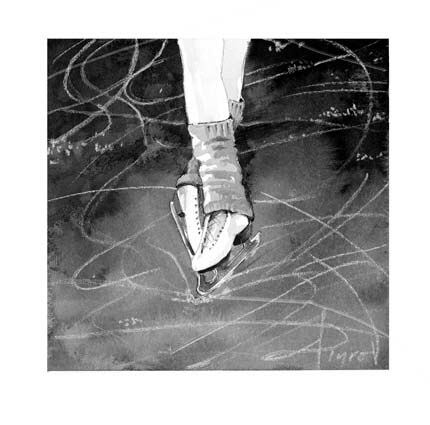 On black ice, every stroke of a skater’s blade leaves a tracing of white. But large lakes rarely freeze black and smooth. A slight wind or wave motion breaks the skim into “frazil ice,” a mush of needles that collect into round pans surrounded by water. Ice formed this way, or during a snowstorm, is white and rough. The noise made by a frozen lake seems ominous to many, but it never sounded so to me. Growing up on a lake, I enjoyed the booming sounds the ice made at night as it contracted, and the groaning sounds of the ice expanding during the day. Unfortunately, full freezes are becoming less frequent. While Lake Champlain froze over in 2014 and 2015, it had not frozen two years in a row for a decade before that. This year, the lakes got a late start. According to the Environmental Protection Agency, freeze dates have shifted later and thaw dates have shifted earlier, in a trend that began as early as the mid-19th century. The rate of warming in the northeastern United States has increased in the last four decades. Science aside, though, I believe a little magic is a good thing. Especially if it can be captured on skates, or even on a padded belly.